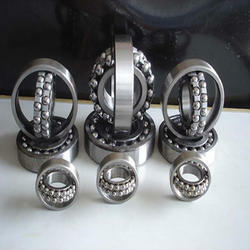 Providing you the best range of deep groove ball bearings, single row angular contact ball bearings, ceramic ball bearing, double row angular contact ball bearings and self aligning ball bearings with effective & timely delivery. 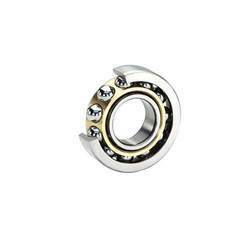 The raceways in both of the rings are in Deep Groove Ball Bearings, which can carry radial and axial load in double directions. They can be applied in situations where high-rotating speed and low noise and low vibration are required. Can be found in automobiles, machine tools, motors, instruments, construct machines, railway vehicles, agricultural machines and various other special machine. With rich industry experience and knowledge, we are providing an excellent quality range of Single Row Angular Contact Ball Bearings. When the single-row angular contact ball bearing is carrying the radial load, they will be a component of force in the axial direction. Therefore it is suggested that two of their bearings be applied in back-to-back or face-to-face arrangements. 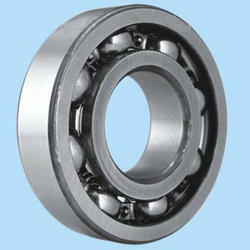 Single row bearings can carry the radial load and axial load in one direction. 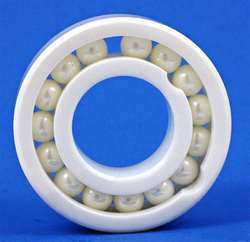 To cater the variegated needs of our esteemed customers, we are highly engaged in offering a wide array of Double Row Angular Contact Ball Bearings. Double-row angular contact ball bearings have two designs of one outer ring and two inner rings and one outer ring and one inner ring. For the design with one outer ring and two inner rings, the axial clearance is easy to control during machining.